Have your steam-heated processes ever experienced unexplainable temperature drops even though the system appears to be working properly? The reason could be a condition known as "steam locking" (when caused by steam) or "air binding" (when caused by air or a non-condensable gas such as carbon dioxide). While countermeasures for these two problems might differ, their mechanism is the same: steam or non-condensable gas such as air enters the trap in front of condensate and shuts the trap valve, impeding condensate discharge. Steam locking is typically not caused by the steam traps themselves because these are designed to close when steam enters them. Rather, it is the configuration of the equipment or piping around the trap that typically causes the problem. Steam locking should not be left unresolved because problems can worsen over time. Since it can be a difficult problem to pinpoint, it is important to understand typical setups that can lead to the problem. Temperature problems with steam-heated equipment can sometimes occur due to steam locking, which can cause condensate to pool into equipment. If the steam locking is caused by a steam-condensate mixture entering the trap, then a steam trap with an optional "lock release" valve or needle valve should be used to install a bypass line that will allow for a small amount of steam to flow downstream of the trap. 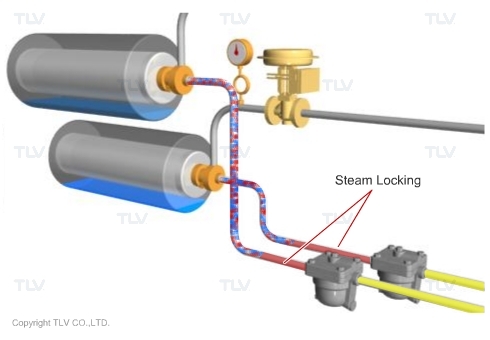 If the steam locking is caused by piping configuration, then the piping must be corrected to allow condensate to naturally flow into the trap in front of steam. When equipment configuration causes steam locking, one solution is to first discharge the steam-condensate mixture into a receiver such as a flash tank before discharging condensate through a steam trap. The separated steam should then be returned to the heat exchanger for reuse. However, this setup can be difficult with certain types of equipment such as rotating dryers that use a siphon pipe or internal scoops to discharge condensate. If reusing steam is not an option, then a different countermeasure is required. When using a siphon pipe, steam pressure is used to forcibly discharge condensate out of the equipment, sometimes causing steam to be mixed in with the condensate. Another countermeasure is the use of a lock release valve or needle valve to allow steam to be released to the downstream side of the trap, fixing the steam locking problem. Since lock release valves and needle valves can control the release of steam, steam loss is minimized. A lock release valve uses the automatic venting feature of a steam trap (such as an X-element) to forcibly open the valve and release steam to the outlet side of the trap, fixing the steam locking problem. A needle valve releases steam to the outlet side of the trap either internally, if the trap has a built-in venting feature (see above), or externally by using a bypass line (see below). An external bypass line can be installed to allow for steam to bypass the trap, fixing the steam locking. Steam traps should not be installed at the top of vertical sections of piping because this can lead to steam locking. Piping configuration can cause steam to be "locked" within a trap and impede condensate discharge. How does piping configuration cause steam locking? Condensate and steam at the inlet side of a trap experience the same inlet pressure because traps are designed to discharge condensate with minimal steam loss. So steam, which has a lower density than condensate, will logically rise above the condensate when there is a vertical rise and enter the trap before the condensate, causing the valve to shut. Providing extra pressure to forcibly discharge condensate will not resolve the problem because the valve remains shut by steam. A "steam locked" trap will eventually be able to discharge condensate again when the "locked" steam has condensed. In the meantime, however, it may cause condensate back-up in piping and equipment. If the problem is not resolved, it can then reoccur at every following discharge cycle. What about flow at the trap outlet? It might seem peculiar that steam locking only occurs from vertical sections on the inlet side of a trap, and not the outlet. Flash steam at the outlet side of a trap will indeed rise to the top of vertical sections of piping. However, since no other traps follow, nothing remains to stop the steam from flowing out of the piping. This also applies to lines connected to an open or closed vessel used to collect condensate because these already require a negative pressure differential to function, allowing for smooth flow of condensate and flash steam. The pressure differential at the outlet of a steam trap should allow for unrestricted flow of both steam and condensate. Steam locking problems from piping configuration are not limited to vertical sections of piping, but can also happen with other piping configurations. For example, piping set at an incline or bent because of lack of support can also lead to steam locking. The bend in this piping causes steam to be trapped, delaying condensate discharge. Even if piping is installed parallel to the ground, long stretches of narrow piping before a trap can cause steam locking if the piping diameter isn't sufficiently large enough to allow condensate to move in front of the steam. The narrow piping causes steam to be trapped within the steam trap, delaying condensate discharge. "Air binding" is a problem that is similar to "steam locking", but caused by air. It can occur in both steam traps and compressed air/other gas systems, and typically requires a balance line to be resolved. More information on this problem is available in the next article.